Grilled Chicken & Vegetable Skewers – Chef Tom Cooks ! Cut chicken into 1 inch cubes. 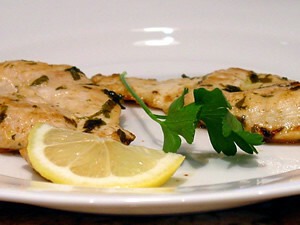 Mix oil, lemon juice, and rind, garlic and herbs together in a shallow dish. Stir in chicken cubes, coating all surfaces with the mixture. Cover and refrigerate for 20-30 minutes. Alternate chicken, squash and tomatoes on 4 skewers, leaving a small space between each piece. Brush each kebab with the remaining marinade. Grill the kebabs over medium heat. About 4 inches above the heat source. Grill for about 10 minutes turning the skewers every 2-3 minutes. Serve once chicken is cooked through and the vegetables are tender. Randy - July 24th, 2008 at 2:55 pm none Comment author #5947 on Grilled Chicken & Vegetable Skewers by Chef Tom Cooks !